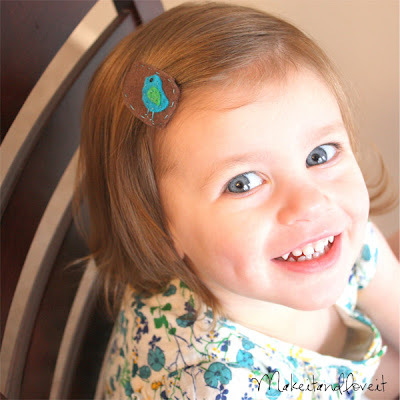 Do you know a little girl who loves putting clips in her hair? Come on, of course you do……who doesn’t have/know a little girl that could use some loveliness?? First, cut out your background piece of felt (using the clip as a sizing guide), that will later be attached to the clip. Cut out whatever sort of shapes you’d like to place on top of your background piece. Stitch around your shapes with some thread and add any buttons, beads, etc. Stitch around the main background piece, just to finish off the look. Then attach the whole thing to your metal clip, by stitching on each end. (Mine had little holes to stitch through but you could also just loop it around a section of the clip.) Be sure to only go halfway through the felt while attaching the clip to it, so you don’t see any of the thread on the other side. Then I dabbed a little hot glue over my knots, just to secure them. And really, you could use any type of glue. I just love my ‘ol glue gun. She serves me well!! Glue this piece of felt to the main piece, right around the edges. This just keeps everything clean and neat. Then, clip right in to your little lady’s hair. Way cute! I can’t wait o try!! What a GREAT idea! I will have to make some of these, for sure! Thanks girlie! Cute blog! I’m stealing ideas and following you now. These are darling! I really like the little bird. I’ll be linking. I love the felt that is too cute!! I just love all your cute ideas!! They are so much fun! 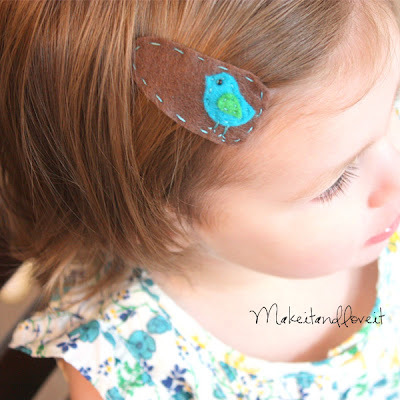 These are adorable and will look darling in my three little girl’s hair! Thanks for always sharing awesome tutorials! Found you through U-Create. Just wanted to tell you the clippies are cute and I have your button! Darling! I am feeling a need to make some. I don’t think my 4 boys would appreciate them, so I’m thinking my nieces might be getting some gifts! These are too cute, great little add-on gifts! Can’t wait to make a few! So cute. I will link to these so i can make them someday! Oh! I can’t wait to have little girls! CUTE IDEA! Hey, I just made some of these and love them! I was just going to tell you that I put velcro on the back of the flowers and on the clips so that I could interchange what was on the clip and not have to make a million! Just thought I would let you know… I love it! I posted on my blog the ones I made. Thanks! Thank you so much! This is exactly the kind of tutorial I was looking for. 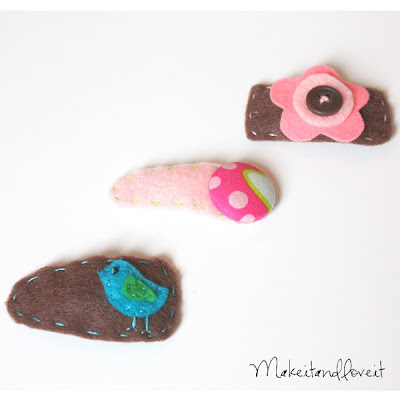 I want to make some of these for my little girl's stocking! You have been bookmarked! I gave it a try! http://the-fantozzis.blogspot.com/2010/02/felt-snap-clip-round-2.html I cut a long strip & just folded it over & cut a slit to poke the point thru. Then I just stiched around the remaining sides. I love it!! This is the only way these stupid clips stay in my daughters hair! Greatest idea ever plus you can get all of these stuff at the dollar store. LOVE IT!! Muchas gracias. Thanks a lot. Very good project… I just made one clip.. It came out well and my kid too love it… I expect you to share more little projects in next hosting.. I'm lucky to found this blog.. Well done!!! wow, they look great, keep up the good work! just got some new felt, so gonna try it! I just love your tutorials! You inspired me to make hairclips for my baby and niece! Will try these designs also soon!